One of the places I kept meaning to get back to, after my two visits four days apart at the end of 2017, was Netherworld, an arcade and bar with a vegan-by-default diner inside (there is the option to add animal products, wish it was all just totally vegan!). It took me a year to get back, at then end of 2018, for my friend's birthday (again). I met them for lunch, and we ate some food. You can read about my previous visits here. We shared some entrees. The Pegasus Poutine (shoestring fries with gravy, melted cheese, and cheese sauce) and the Munchkin Mushies (sesame tempura mushrooms with wasabi mayo). I'd had the mushrooms before, and I love them. The poutine was a new addition to the menu. It was very satisfying, loaded with lots of gravy and cheese, but it got pretty soggy. I wish they had sturdier fries, and it was more a platter rather than a bowl. It was a big serve! 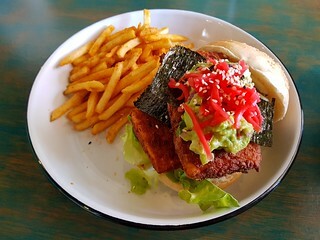 I was super keen to order the Cryptid Classic Burger (crispy fried tofu, pickled ginger, nori, lettuce, tomato, wasabi mayo and avocado). Sounds like a great combination, right? I was disappointed. Instead of just avocado, which would have been great, they instead used their guacamole. A very strong lime and far too spicy guacamole, that overpowered everything. The pickled ginger was a tiny pile, and I couldn't taste the wasabi mayo at all. The tofu was nice, though very salty. I ended up eating one piece of tofu on its own, so I could make the burger fit in my mouth. They had free fries with burgers at lunchtime, so we all had a side of fries as well. 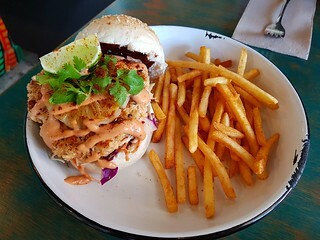 The birthday girl ordered the Swamp Thing Burger (a cajun patty with grilled pineapple, BBQ sauce, chipotle mayo and coleslaw). She liked it, though it is a messy burger so she ate most of it with a knife and fork rather than burger style. Her partner ordered The Burgatory, their take on a cheeseburger with cheese, onion rings, pickles, American mustard, ketchup, lettuce and tomato. I've had this before, and it is a good burger. And he agreed. 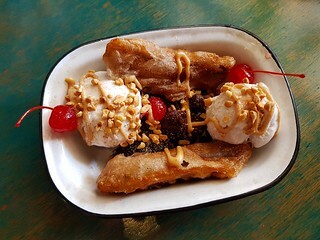 We shared the banana split to finish - banana fritters, choc-hazelnut brownie, peanut butter caramel, ice cream and glace cherries. I skipped the fritters, deep friend fruit is not my thing, but the brownie was good! The ice cream was coconut based, but was OK in small nibbles with the brownie. Netherworld changes their menu fairly often, and I have missed out on a few things I really liked the look at by not going back for almost a year! 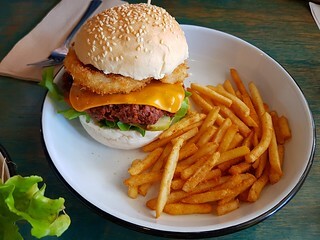 So I really need to make the effort to go there more often, as there are a few things on the current menu that I am definitely interested in, and I wish to have something better than the burger that I had at this visit. I'll get back to the pile of kittens in my next posts, but just wanted to share that Dim Sim's blood results came back as all stable for her kidneys, liver, and thyroid! My good perfect girl. 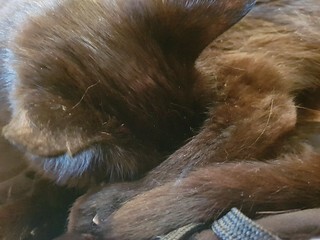 Here she is, deep in sleep. I have never in my life had poutine. That seems so wrong! It's everything I love in one dish!! OMG that is one gorgeous banana split. I swear you find the best ice cream!! I am so happy for Dim Sim and you! I'm sure everyone slept well that night!! I love poutine! Potato, gravy, cheese... yes please. Technically a true poutine has to have cheese curds, but I have never seen vegan cheese curds so they normally just have cheese sauce or cheese. I'm not a purist about it, so I am just happy to eat it all! You should do oven fries with gravy! It is so tasty! In New Jersey we call them "disco fries" and we do mozzarella cheese instead of curds. I have heard of disco fries! 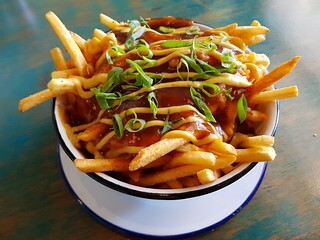 I think a lot of places that are doing vegan poutine are technically more like disco fries as they don't have curd. Big chunky crispy oven fries would be perfect. Bummer that it isn't ALL vegan, but I like the idea that everything is vegan and they charge more for the meat. Totally how every restaurant should be. I agree, vegan should be the default and pay more if you want something added! 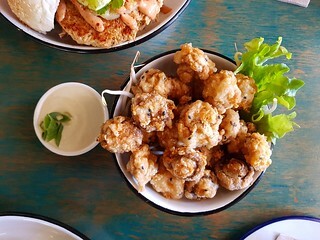 The poutine and tempura mushrooms both look so good! And the Swamp Thing Burger sounds quite fun! Hooray for sweet Dim Sim!